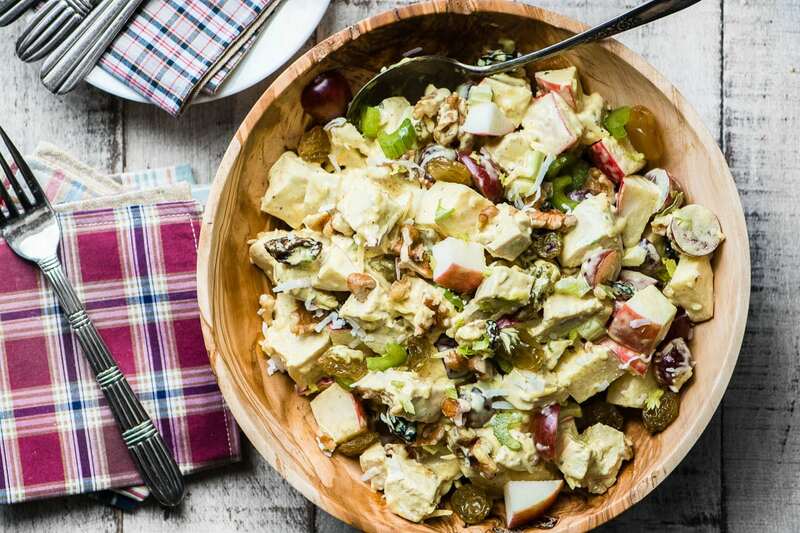 Curried Chicken Waldorf Salad ~ everybody loves chicken salad, but jazz it up with warm Indian spices, crisp apples, celery, raisins, walnuts, coconut, and grapes and it becomes a fork magnet. 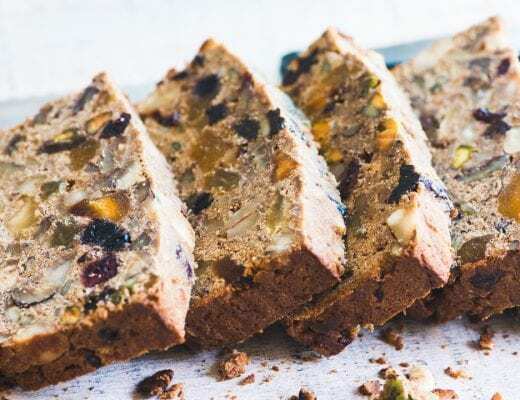 This recipes comes in so handy ~ you can dress it up or dress it down for luncheons, potlucks, or weeknight dinners on the patio. Bring the leftovers for lunch in a mason jar and be the envy of the entire office. 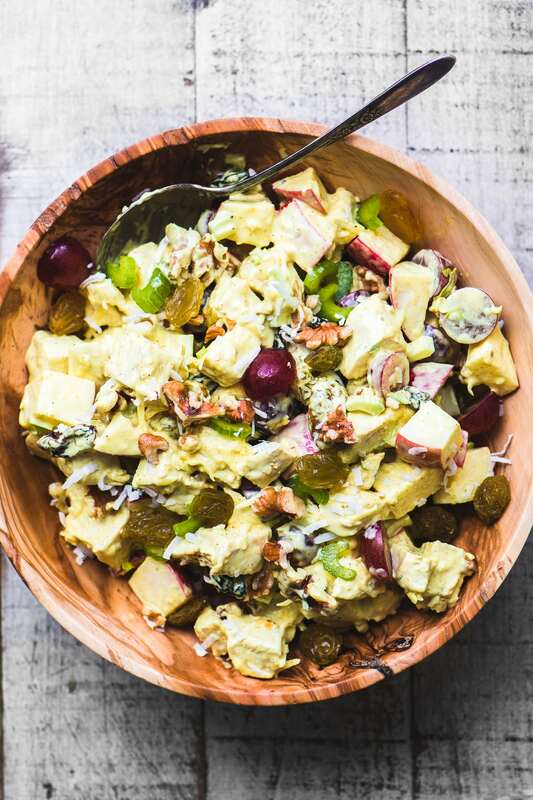 I could have made curried chicken salad and left it at that, but my way is so much better, loaded with add-ins stolen from the classic Waldorf salad. The Waldorf’s century old formula still holds sway over summer menus with it’s refreshing combination of apples, celery, walnuts, and raisins. The recipe has been re-invented countless times over the years, so I’ll throw my hat into the ring with this hearty, slightly spicy version. The combination of Indian spices and a refreshing crunch elevates this chicken salad to company-worthy status. This flavor packed chicken salad can absolutely be a complete meal for a warm night, I like to cut the chicken extra chunky and serve each portion in a large leaf of butter lettuce. Some great corn on the cob would complete the meal nicely! Chicken Salad with Poppy Seed Mayo. Make it a sandwich ~ cut everything extra fine to use this chicken salad as a sandwich filling. Make it elegant ~ stuff this inside an avocado half, a hollowed out tomato, or in endive lettuce leaves. Make it lighter ~ cut the mayo with half Greek yogurt. Make it spicy ~ add cayenne pepper to taste, start with 1/4 teaspoon. Make it convenient ~ use rotisserie chicken! 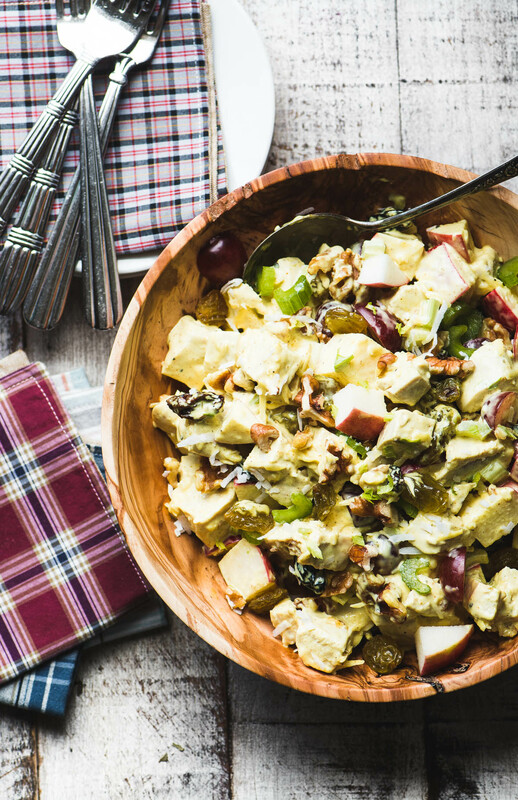 don’t forget to pin this Curried Chicken Waldorf Salad! Really good, even without grapes! I, too, made the Silver Palate chicken salad, over and over and when I had a curry craving also added curry powder and some Major Grey’s chutney and subracted the tarragon. Yours, however, was definitely an easier clean up! That pan with the creme fraiche! Oy! Thanks Sue! I just love your recipes and your photos! I’m so glad you liked this Alene, I donated my Silver Palate Cookbook years ago and moved on…it was fun while it lasted but I think cooking should be simplified! Its looking so beautiful and yummy. Love to taste it. Inspired Stuff – Thanks! 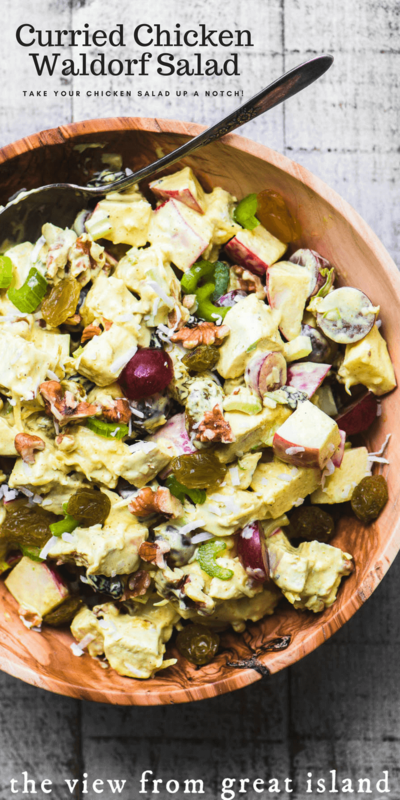 You’ve combined a couple of my summer favorites into one gorgeous salad!! Love the creamy, tangy sweetness of mango in the dressing! I LOVE curried chicken salad Sue! And all the other yummy ingredients you’ve included sound amazing! I’ve got to try this one! 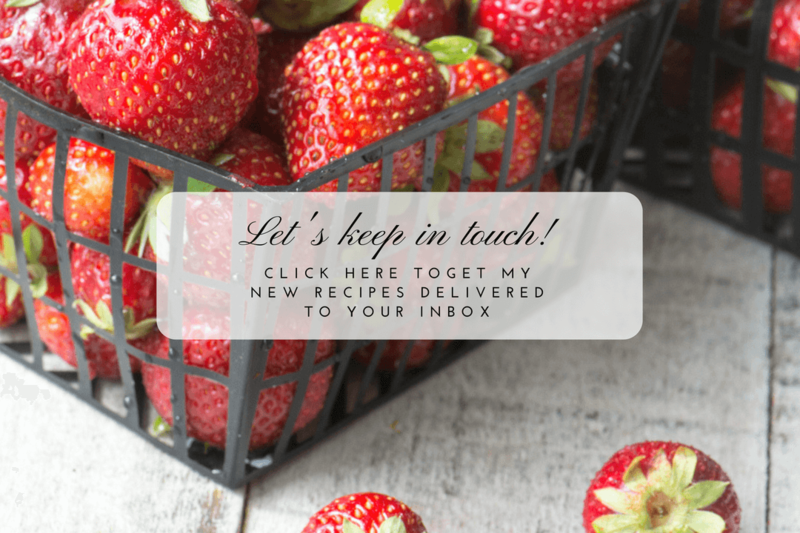 Hi Sue – your salad looks amazing and I can’t wait to try it! One question – I’m deathly allergic to mango so can’t include chutney in the dressing. Any ideas on another ingredient to jazz the dressing up? Thanks so much! You could try another kind of chutney, my store has several and I bet some of them don’t have any mango in them. Otherwise possibly some marmalade or apricot jam. You copied “MY” salad! Been doing this, especially during our warmer winter seasons. You can play this one up with all kinds of ingredients. Hey Sue, if you need any other ideas just let me know. My husband makes a wonderful summer fruit salad with a light spicey dressing. Or just use lime juice and a touch of honey to coat the fruit. Sprinkle on some chili peppers for the spice. Go ahead you can use that idea too! I need that spicy fruit salad recipe Donna-Marie! Once I discovered “The Silver Palate’s” Chicken Tarragon Salad recipe, I’ve never cooked chicken breasts any other way. They have you bake them in a 350 oven for about 20 minutes, with creme fraiche on top, for about 20 minutes. I’ve determined that bone in breasts yield way more flavor. Their method will work well with this yummy recipe, too. I’m sure. Thanks Sue, I’ll definitely try it soon. omg that sounds good, I’ll give it a try, I adore creme fraiche. I also love chicken with tarragon, and have a wonderful creamy tarragon chicken on the blog from way back ~ Roast Chicken Breasts with Tarragon and Mustard Sauce. 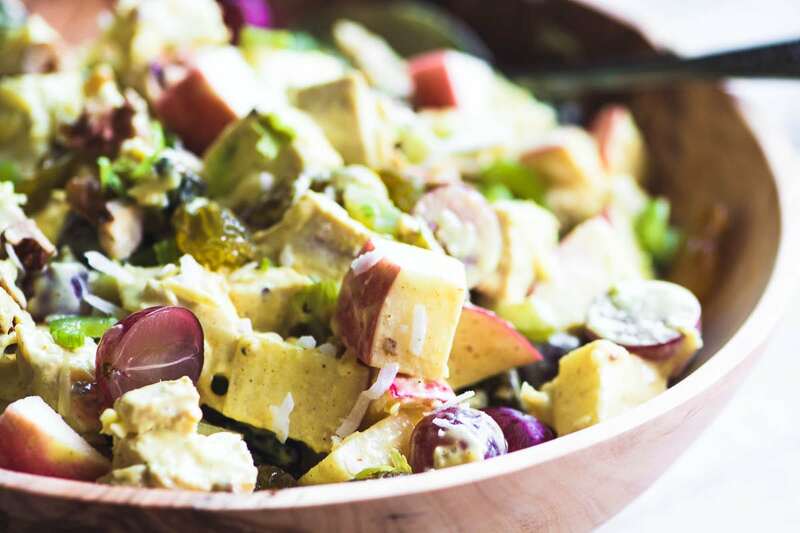 I love curried chicken salad and especially loving your take on it! 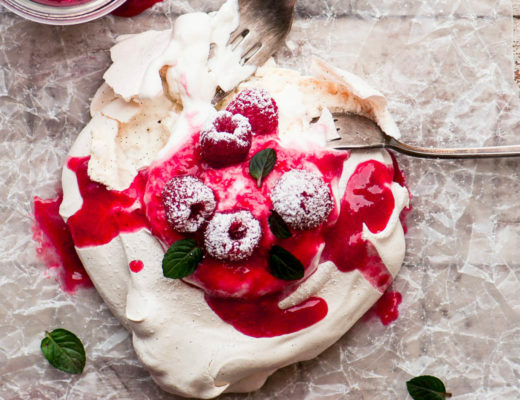 A great twist on the classic and so pretty, too! I dunno. The recipe seems to lack ingredients shown in the picture. Am I crazy? Totally outstanding! This is going into regular rotation. The dressing is out of this world! Thanks for another winner. Neat dish! I’ve made Waldorf Salad with leftover fried chicken, but never thought to add curry. Really nice! Thanks. Fried chicken sounds wonderful, wouldn’t have thought of that, thanks John. That’s a great twist with the dressing! The salad looks wonderfully delicious, Sue. I would have never thought to add all those wonderful ingredients to chicken salad – but can’t wait to try it! A great summer dinner for sure. I will always pick this kind of salad at a deli, so happy to have a recipe to make it myself. And I love all your variations!